Aracena is one of my most visited places in Andalusia. 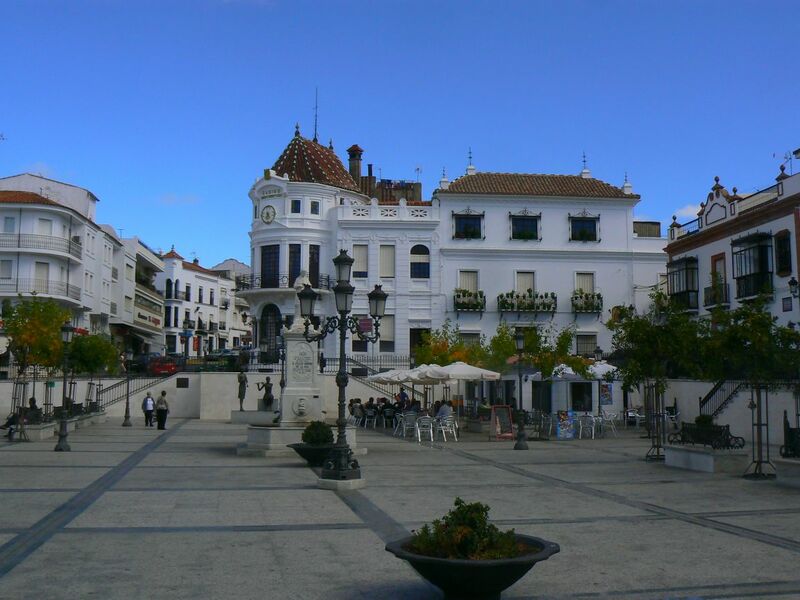 It is the name of the mountainous northern region in the province of Huelva and also the name of the largest town in the area. I have been visiting the town of Aracena since I was very young. In primary school my first excursion was to La Gruta de las Maravillas (The Cave of Wonders) where I bought the first souvenir in my life and my mother kept it for many years. Last year I went to Aracena with my parents but sadly the Cave was closed, but we enjoyed a lot in the ancient washing place as my mother and I pretended we were washing, like in the old times. We also tried to visit Eíriz and its natural drying houses of iberian hams, but groups were full. The problem was that we went there during estate holidays, very busy moments in touristic attractions and activities, without booking with enough advance. Of course I know we could have managed better, but my parents, typical of them, decided to go the day before. The thing is the town of Aracena is only 1 hour driving from where we live, in Seville, so it is pretty easy to go any time you want. Anyway, we walked around the streets towards the castle. Many towns in the Natural Park of Aracena and Picos de Aroche still preserved their fortifications as they were part of the Galician band, which I talked about it in my post of Sierra Norte. The mountains of Aracena and Northern Seville are a single entity, but they are artificially divided by the administration within the two provinces of Huelva and Seville. This is why the Galician band spreads out all along from Aroche and Aracena to Sierra Norte. In particular, the castle of Aracena was built in the 13th century and rebuilt more times later, but we can still enjoy its beautiful Islamic decoration, mainly mudejar. After that, we went to the Museum of the Ham where we learnt a lot about the production of Iberian ham and specifically about the Ham from Jabugo, which is the present name of the Denomination of Origin. There are guided tours in the museum daily, but in the case you want them in English it is necessary to call and book in advance. At the end of the visit they give two slices of ham to taste it, but it is not served in the way it has to be served, so please, try Ham from Jabugo in other place. There are many local shops and bars where you can try a delicious ham cut after you order it. Once we finished in the Museum, we drove to other beautiful places in the area, but we came back to try some sweets and have a coffee. A famous cake shop in Aracena is Confitería Rufino, very close to Marquis of Aracena square, the main one, where there is a beautiful building designed by the architect Anibal González, the same who projected Plaza España in Seville. I would recommend to buy some piñonates at Rufino’s and taste them with a coffee or another drink you may prefer in any cafe of the main square. One of the hotels in my wishlist is the Hotel Convento Aracena, very close to the castle, because it is a restored cloister convent converted into a 4 stars hotel with Spa. I have visited the gardens and the old cloister and they were very peaceful and silence. A very close town to Aracena is Higuera de la Sierra, with only 1.400 inhabitants (Aracena has a population of almost 8.000 people). I would never visit this small village if it wasn’t because one of my best friends, Pau, is from there. He said to me that the name of his town is “Fig tree of the mountains” because originally in the place there was just a tavern next to a fig tree, but nowadays there are no figs around. With or without figs, in the main square of Higuera de la Sierra there is a gorgeous restaurant called Jacaranda, and if you go there in Autumn please try the rice with boletus. Delicious! But the most impressive tradition in this town is the Cabalgata of the 5th of January. Following the Catholic tradition, in Spain the day that kids receive presents is the 6th of January, which is the Day of the Three Wise Men. The evening before in many towns and cities there are promenades that celebrate the coming of the Three Wise Men with their gifts for the infant Jesus. In the course, they throw sweets into the crowd. The special characteristic in the Cabalgata of Higuera is that their neighbors represent Nativity Scenes on top of the floats. They don’t move at all, they are like frozen actions, so it is quite impressive. I went with my husband in 2015 and he thought that the people were statues! Moreover keep in mind that we were in the mountains in the middle of the winter. Temperatures were very low and lots of people on the floats were wearing short sleeves or very thing tunics. In this video you can see the full cabalgata of 2015. A town even smaller than Higuera de la Sierra is Alájar (only 800 inhabitants), but within its municipality is one of the most visited areas of the region: Peña de Arias Montano, called in that way because the humanist Benito Arias Montano lived there in the 16th century. It has been declared Natural Monument and it is a place with a special atmosphere. Talking again about the visit I made with my parents last year, one of the most beautiful moments was when my mother turned on a candle in the hermitage of our lady of Los Ángeles. This is something that religious people do quite often in my country. It is a way to ask God or the Virgin to protect you or to help you on getting over a disease or a difficult situation. When my mother did it she was living some sad moments and I felt moved when she asked me if she could put a candle to the Virgin. As we are in the countryside we can do many walking paths. In 2009, when I was young an innocent (not so much), I went there with some of my friends for hiking. We park the car in the urban area of Alajar, and we walked to Peña Arias Montano and from there to a small village called El Calabacino, a place that was re-populated in the 70’s by bohemian, artists and artisans. They have their own vegetable patches and animals, and for many years they were living without electricity but now they use solar wafers. The 103 inhabitants define the village as an ecoaldea or eco-village. In the way through El Calabacino we saw their restored houses, fruit and chestnuts trees and different animals. It is this kind of places that makes you think about leaving your urban life and move there to live in harmony with the Nature. The last place in this post is Linares de la Sierra, with only 300 inhabitants but probably with the most beautiful streets in all the Natural Park. Once you are walking around it is impossible to not have the feeling you have traveled more than 50 years in time. They conserved the stony pavement. It makes difficult to walk but it is very beautiful, and probably it is the best material during the cold seasons to make the surface less slippery. The highlights of this town are its beautiful church from the 18th century, the drinking through and washing place (I insist again: I love washing places) and the mosaics at the entrance of the houses. They are a very beautiful way to create a surface to place a chair or two outside the house, where to sit down after the sunset in the summer and enjoy the breeze in the freshest time of the day. I used to do the same every summer in my grandmother’s house, so I have beautiful memories about this lovely Andalusian tradition that it is disappearing little by little, but in Linares they still do it. In this town I also have two places in my wishlist: The hotel-hamman La Molinilla and the restaurant Arrieros. Oh my god, I can’t wait to go back again! There are many other towns to visit in the region of Aracena. Getting closer to Portugal you can find Cortegana, with an enormous castle, or Aroche, where you can taste their famous sausages seasoned with anisette. Jabugo is close to them too and it is the place that give the name to the denomination of origin of the Iberian ham produced in these mountains. Other small and beautiful places could be Fuenteheridos, Santana La Real and Almonaster la Real. The last one preserves a very old Mosque within the castle. In resumen, there is always something new to discover in the Natural Park of Aracena and Picos de Aroche. Finally, if you go there during the montanera it would be very easy to see the pigs in the dehesas. From October to March the Iberian pigs (which are black and not pink) live among the holm and cork oaks in the countryside to eat their acorns. This period called montanera is in the last months of their lives and it is a very important part in the production of Iberian ham: if pigs are not fed with acorns the ham would not be considered real Iberian ham. What a gorgeous and informative post, Penelope — you’ve taught me so much! Thank you for illustrating so beautifully that these smaller cities (and tiny towns) that whiz by outside the train window are well worth a visit too. Itactually a nice and useful piece of information. I happy that you shared this useful information with us. Please keep us informed like this. Thank you for sharing. Previous Previous post: Fun with Andalusian Flags!